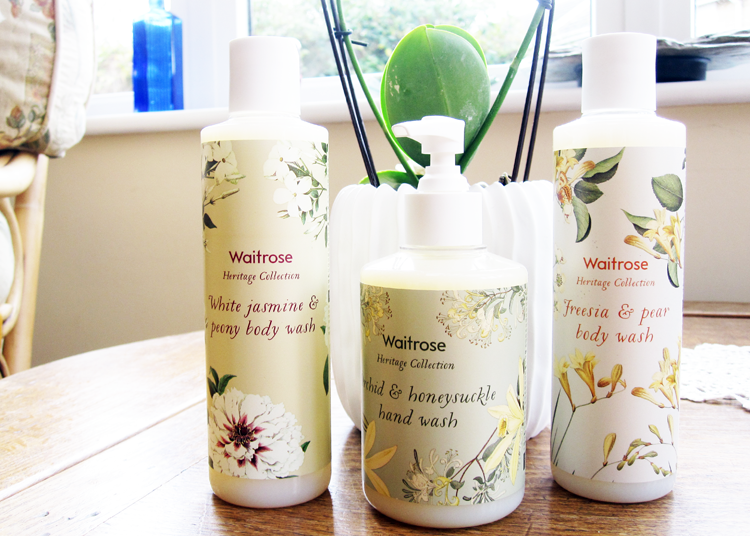 Waitrose have recently released a brand new own-brand toiletries line called the Heritage Collection. I love anything floral and vintage-inspired, so when I saw the packaging for these, well I had to try them out. This new Heritage Collection has been inspired by Waitrose customers' favourite flowers and features three signature scents which have been crafted by classically trained perfumers; White Jasmine & Peony, Freesia & Pear and Orchid & Honeysuckle. I've been testing out the White Jasmine & Peony Body Wash* (250ml, £2.99), Freesia & Pear Body Wash* (250ml, £3.50) and Orchid & Honeysuckle Hand Wash* (250ml, £2.99) to get a feel for the range and all of the scents are very fresh and floral, with an endearing old-fashioned English charm about them. I was a little worried at first when I saw that the formulas have SLS in them, but so far, I haven't had any problems with using them on my sensitive skin and they have a nice hydrating feel on the skin afterwards. As the supermarket has quite a larger mature customer base than others, I feel the Heritage Collection will prove to be very popular among them. That said, I'm twenty-something and I'm quite enamoured with it myself! Everything in the range is budget friendly with products being priced between £1.99 and £3.50, and like the rest of Waitrose's own brand beauty and cleaning products, the collection is cruelty free (Leaping Bunny accredited). Available in Waitrose stores and online at waitrose.com with special introductory prices until the 8th December 2015.